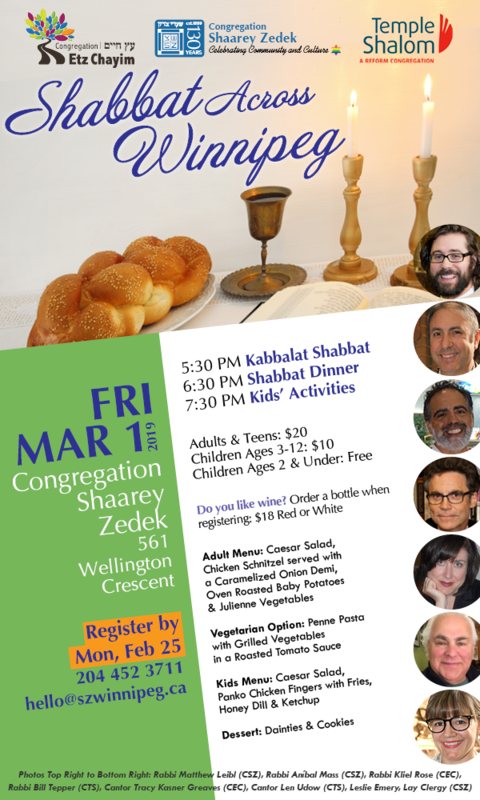 As you may be aware our three synagogues, Congregation Etz Chayim, Temple Shalom and Congregation Shaarey Zedek, are hosting a community Shabbat dinner this coming Friday evening. This provides the opportunity for our greater community to come together and enjoy a Shabbat Service and traditional dinner. As part of the Shabbat experience, we also want to be engaged and had arranged for a young rabbinic intern, to speak on Digital Judaism, a topic of growing interest in our community. Over the last week our community has been inundated with messages and social media commentary, decrying our decision to invite this speaker, specifically as it relates to the beliefs and political positions of an organization with which he is affiliated. While we strongly believe that engaging in open dialogue, and challenging assumptions is healthy and valuable, and indeed inherently ‘Jewish’, the objective of this Shabbat is to be a peaceful, thoughtful and engaging evening where we celebrate and break bread together as a community. With over 200 Jewish Winnipeggers already signed up to attend, we have an obligation to provide a meaningful Shabbat experience. To that end, and in the overall spirit of Shalom we have withdrawn our invitation to our speaker. Thank you for your understanding. We look forward to celebrating Shabbat together.